In metrology, gauges and comparators play a significant role, Gauges are used to determine whether a dimension lies within the given range whereas the comparators are used for comparison of the actual dimension with the working standard. In this article, we are going to discuss What is the difference between Gauges and Comparators. let’s see the difference between Gauges and Comparators. 1. Gauges are used to Determine the dimensions whether they are lies within the given limits of size or not. 1. Comparators are used to compare the workpiece dimensions with the working standards. 2. Gauges will determine the amount of deviation from the given size. 2. The Comparator determines the difference between the actual workpiece dimensions with working standard. 4. No indicator is provided to show whether the dimension lies within the given limits. 4. There is an indicator to show the deviation of the workpiece from the actual working standard. 5. Not Suitable for Larger dimensions. 5. Can be used compare the larger dimensions. Electrical comparators, Optical comparators, Pneumatic comparators. 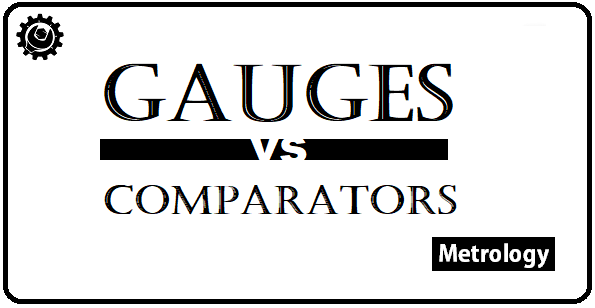 Tags: the difference between Gauges and Comparators, Gauges vs comparators, Comparators vs Gauges, Metrology, Comparators.